Nathan was diagnosed with high-risk neuroblastoma one month shy of his seventh birthday and just one month into first grade. Before his diagnosis, he loved going to the park, practicing taekwondo, swimming and biking. He’s had to adjust his hobbies due to his disease, but his positive outlook has remained the same. Nathan is now in the midst of an 18-month treatment plan that includes chemotherapy, radiation, immunotherapy and a stem cell transplant. He remains full of life and is always quick to help his nurses in any way he can! Nathan’s parents are separated, but work as a team to help support their son during this journey. His mom has quit her job to be by Nathan’s side and take care of his sister. His dad provides additional finances whenever he can and goes with Nathan to every chemotherapy appointment. The added expenses of travel, food and parking while at the hospital in addition to time off of work have added significant stress to the family. When they started falling further and further behind on their car loan, Nathan’s social worker contacted Family Reach for financial assistance. We stepped in and provided a grant to cover this loan and provide immediate relief at an important time in Nathan’s treatment plan. While a tumor remains in Nathan’s abdomen and he requires additional rounds of chemotherapy, we are happy to report that his bone cancer has reduced significantly. This news along with the financial relief we provided have given the family hope and strength to continue their fight against cancer. Interested in helping families like Nathan’s? Become a Key Holder today! 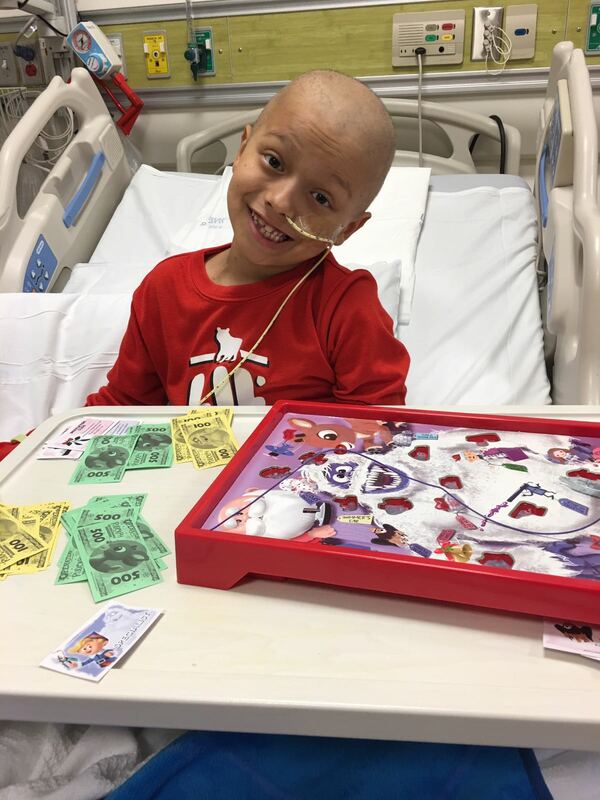 Nathan enjoys a board game while at Children's Hospital Los Angeles!